Russian beauty became the wife of the monarch, but will not be the queen. The winner of the contest "Miss Moscow 2015" Oksana Voevodina. The winner of the contest "Miss Moscow 2015" Oksana Voevodina. 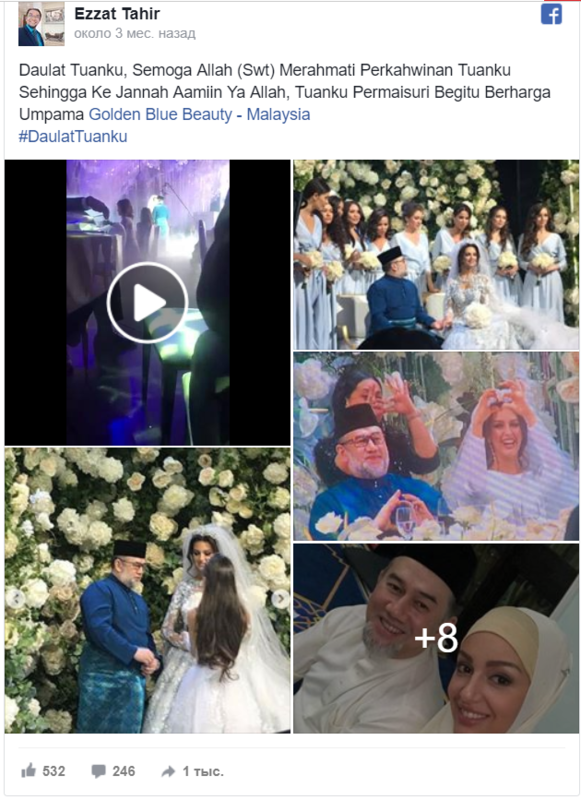 © / www.globallookpress.com 258 four 51 The winner of the contest "Miss Moscow 2015" Oksana Voevodina is the spouse of the king of Malaysia. According to the Super portal, the wedding of the Russian beauty and the monarch Muhammad V was held in Barvikha near Moscow. The bride appeared before the guests in a traditional white dress, and the groom in national dress. The event was held in accordance with Muslim traditions - without alcohol and exclusively with halal treats. However, this is clearly not upset neither the bride nor the wedding guests. According to Super, before entering into marriage, the Russian woman converted to Islam and changed her name. From now on, her name is Rihana. Oksana Voevodina won the Miss Moscow title in 2015 at the age of 22 years. At that time, the girl was a graduate student at the Plekhanov Russian State University of Economics faculty. Prior to this, Oksana worked for several years as a model abroad. The girl, she said, at that time was learning English, and also was keen on photography, clothing design and accessories. Some time ago, Oksana appeared on various television shows, where she boldly answered the sharp jokes of the presenters, and was not averse to demonstrating her ideal parameters. Apparently, now "Miss Moscow 2015" will follow more stringent standards. Even before the wedding Oksana was captured in the hijab. For Muhammad V this is not the first marriage. Muhammad V of Kelantan from 2004 to 2008 was married to a lady from the royal family of Pattani, but the couple divorced. The future king of Malaysia was educated at home, as well as in Thailand and the UK. He became King of Malaysia at the end of 2016, and his term will expire at the end of 2021. It's all in a rather unusual state system of Malaysia. Of the 13 states of the federation, nine are monarchies. Seven of them are ruled by sultans, one by rajah, and another ruler wears the traditional Malay title. Every five years, nine monarchs choose from among their ranks the Supreme Ruler (King), and his deputy assistant. The supreme ruler and sultans perform mainly representative functions, but all laws and constitutional amendments are subject to their approval. In September 2010, Muhammad V became the sultan of the state of Kelantan, replacing his father. Less than a year and a half later, he was elected Vice-King, and in 2016, the monarch colleagues nominated him for the royal post. However, the newly appeared Rihana, known as Oksana Voevodina, will not get the title of queen even during the period while the spouse is king. According to the laws of Malaysia, only a native of this country can be a queen. But only a divorce can prevent "Miss Moscow-2015" to be the wife of the Sultan. By the way, the young husband is almost twice as old as his darling - Muhammad V is 49 years old. Despite this, the king still has no children, so the 25-year-old Russian woman, obviously, has a responsible mission ahead - the heir to the throne is required.